John Parish Limited is here to work with you to achieve the luxury look you deserve in your bathroom with quality workmanship. John will come to your home for an initial site visit, at no cost, to discuss your ideas and design and carry out a free visual and feasibility check on your plumbing and electrical systems. We can also recommend suppliers of quality bathroom furniture and fittings, electrical fittings to the required British Standard (BS7671-2008) and tiling companies to complement your design. These can either be sourced and arranged by ourselves or supplied by you. John will also discuss suitable means of legal waste disposal before sending our quotation of works. "I've put your business card up at work!" Alongside complete bathroom installations we will work with you on any part of the above services to suit your own skills and requirements to help you achieve the final look that you desire. 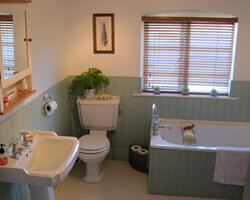 We also undertake cloakroom re-design installations / upgrades and repairs.